The big activity at a birthday party that Serafina attended today was riding a "quad". When I dropped her off, the Mom asked me if it was OK if Serafina rode a quad during the event. Thinking she'd be behind some adult driving, I said sure. When I came to pick her up, this is what I found. 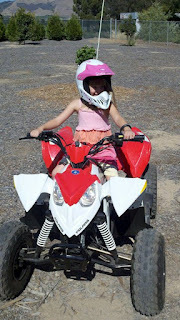 The girls were running the new quad around by themselves. Serafina's eyes were about the size of saucers as she mounted up, but she did manage to "pulse" her way around the back yard. A little burst, then near stop, another little burst (of courage, mostly), then stop... repeat.